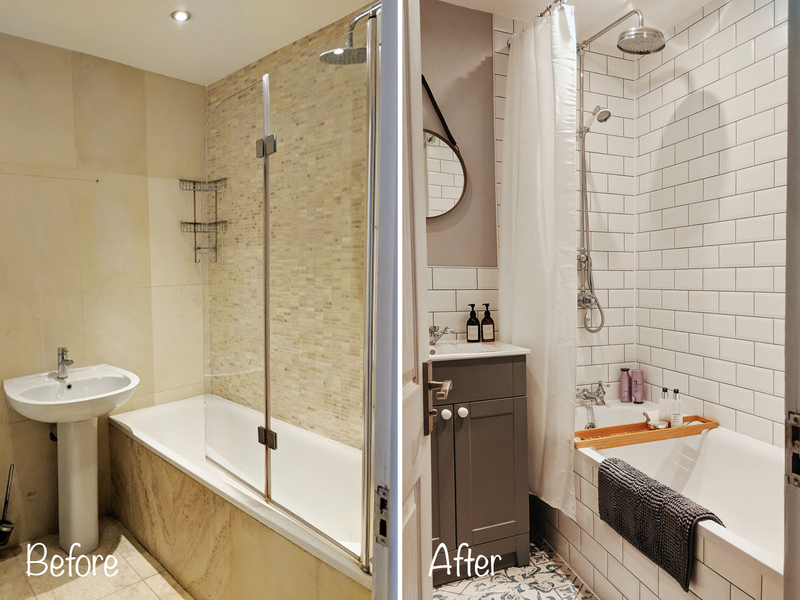 You may have seen our master bedroom reveal, well, our bathroom was actually the first project we undertook when we bought our new home. 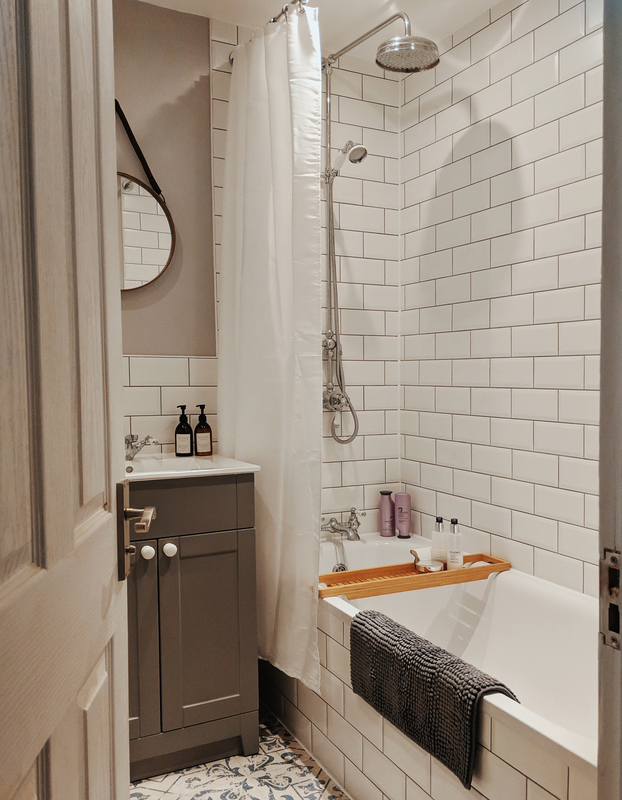 But as with most home renovations, timeframes and schedules change, other issues pop along the way, and we ended up tackling both the bathroom and master bedroom at the same time. Our bathroom was always going to be our first project, because unfortunately the day we moved in, there were a number of leaks! The bath taps made a terrible screeching noise, the shower didn’t get particularly hot, the toilet was leaking, and the sink taps were freezing cold. No sooner had we finished unpacking, than a plumber, who had been in the flat below, quickly came up to tell us that we had a leak. This leak was coming from somewhere in our bathroom, and was dripping through the kitchen lights in the flat below. Nightmare! Not what you want to hear the day you move in to the first property you’ve bought. There’s no landlord to call and complain to, this is on us. When we viewed the property, the bathroom was our least favourite room. So we were always aware that we would refurbish it, but we weren’t expecting to have to do it quite so soon. 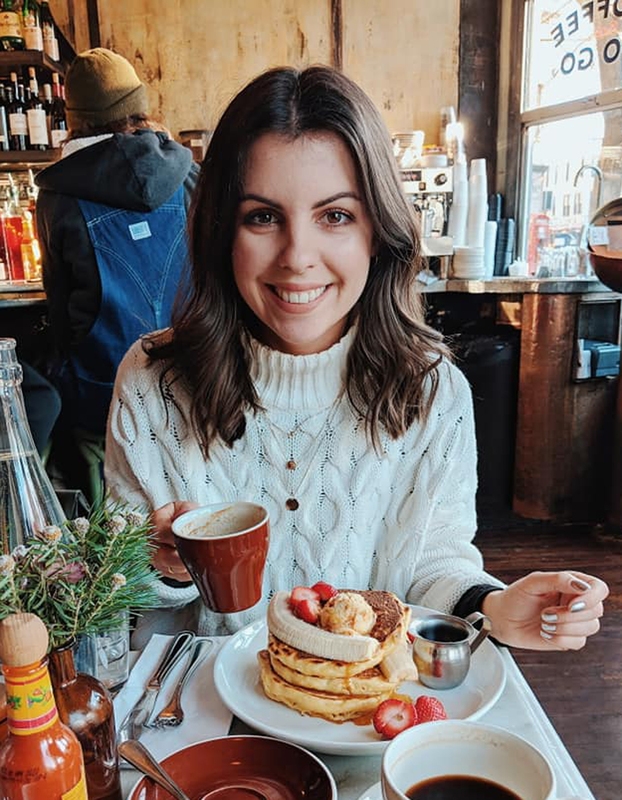 Having just moved in, we were limited with our finances. We gathered some quotes and they were, as expected for London, very expensive. To our relief a friend of ours told us that he used to fit bathrooms after he’d finished university, and offered to help us out. He gave us a quote, that was half the price of all the others we’d collected, and we jumped at it! 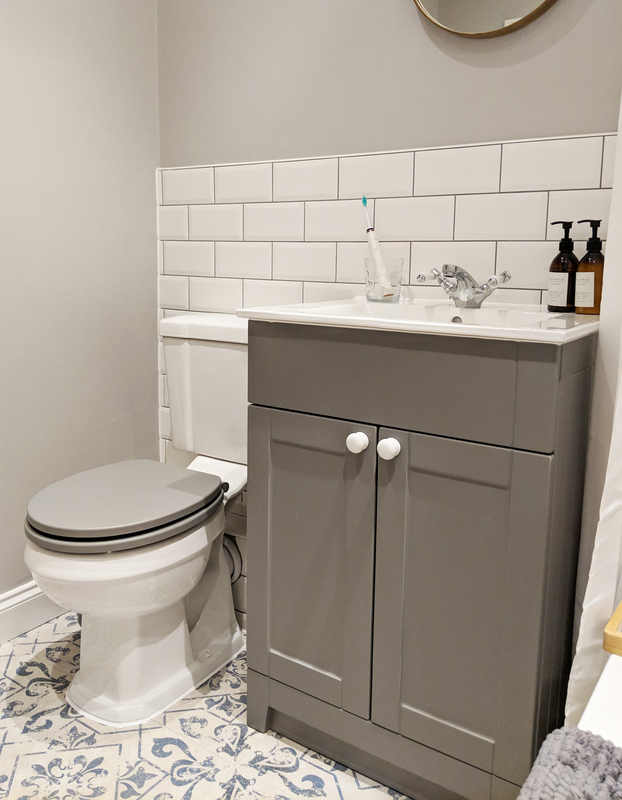 He had a full time job, so it meant that work could only take place at evenings and weekends, so the project took a lot longer than it would’ve if we’d have gone with a professional plumber. But having a friend help has many positives. It allowed us to be a lot closer to the project. We were able to ask his advice before buying things. We could have an honest conversation about what was possible and what would be too expensive, or too much work. If things didn’t go to plan, or unexpected plumbing issues popped up, we knew that he was telling us the truth, and not trying to rip us off! It was a testing experience at times, having never done anything like this before. We really had no idea what we were getting ourselves into, and bathrooms are not cheap, or easy! There were weeks where we had no shower, months with no sink. We were brushing our teeth in the kitchen, showering at work. We look back now and laugh, but there were times where it felt like everything was going wrong. The previous owners had done a really bad job of the plumbing, tiling, plastering – just about everything! So the task of renovating the bathroom kept getting bigger and bigger. It was no normal refurbishment, that’s for sure. But it’s certainly taught us a lot. One of the first things I quickly realised, was how expensive a bathroom can be. I spent hours pinning beautiful bathrooms on Pinterest, saving photos on Instagram, to only find out that a gold coloured shower is going to cost us upwards of £700. The same with gold sink taps, and gold bath taps. That beautiful shiny blue wall tiles are going to cost 5 times the amount of white. That a Victorian sink is stunning, but in a small bathroom we need storage, so vanity unit is the only way to go. It’s not quite what I first imagined, but we’re so happy with the finished product. Our friend was an absolute perfectionist, which meant we’ve ended up with a fantastic job, that we can be proud of and hopefully add a little value to the house. When you see what the bathroom looked like before, you might not think there was an awful lot wrong with it. If it wasn’t for all of the dodgy plumbing, we probably could’ve lived with it for a little longer. However, up close, you quickly spotted lots of issues, things that had never been done correctly. It was as though whoever fitted the bathroom had never fitted a bathroom before! Or they were on a very tight budget, and a very tight timeframe. We wonder if they had put it in just to sell the property. Floor tiles had been used on the walls and floors. They were all different colours and patterns (you can see in the corner of the bath that the wall tiles are a lighter shade than the rest). Mosaic tiles had been put on the one side of the bath, which has been laid with the strongest type of glue. Meaning when we ripped them down, it was impossible to do so without ripping down the plasterboard behind with it too. The sink overlapped the bath, and the glass shower screen no longer bent in the middle, meaning you’d have to strategically hop over the sink to get into the shower. They’d left their toilet brush behind (which was disgustingly dirty) and it was held in a broken glass pot. Why? Just take it off, throw it away! There was a shaver socket precariously hooked up next to the sink. That had to be disconnected and removed. The heated towel rail didn’t work. 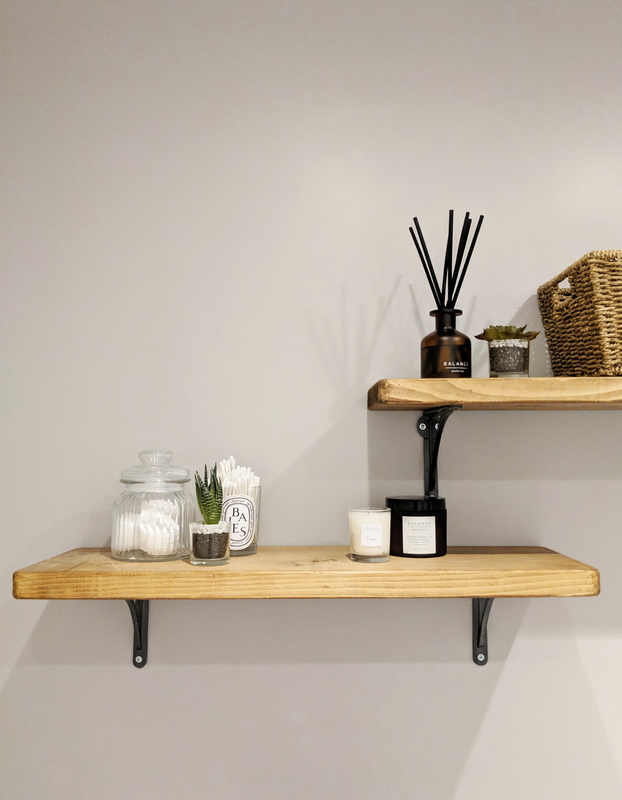 And there were some rather random wooden shelves in the corner next to the toilet, which were filthy, chipped and hanging away from the wall. A complete bodge job! Storage is often at a premium in bathrooms. Our bathroom is particularly small, with no window (much to my dismay), and no room to really have a storage unit or too many shelves. As I said before, I never wanted a vanity unit. It’s not something I’ve ever really liked in bathrooms, but it made sense for us to have one, and it’s a god send. 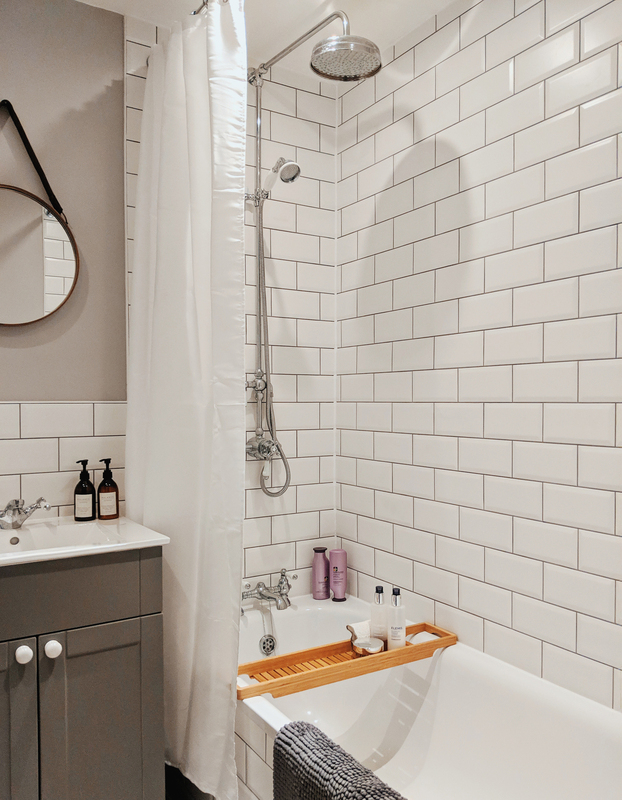 It’s great to put all of our bits and pieces inside, to keep the bathroom looking as clean and minimal as possible. When space is at a premium, a room can quickly become messy and cluttered, but this vanity unit solves those problems. I’m also, so pleased with the colour of it, as it matches the toilet seat perfectly. They were bought from different suppliers, so I was really worried that they might not match. I’ve always wanted patterned floor tiles in my bathroom. They help bring some colour and movement to a small space, but trying to choose the right pattern was so confusing. It’s very difficult to see the tiles properly when shopping online. We went to some tile shops, but still it’s hard to envision what they’ll look like in your own room. I also found it difficult trying to calculate how much they would cost, and soon realised that all the ones I liked would cost an obscene amount of money for such a small space. So we settled on these from Walls & Floors, and I’m so happy with how they turned out. Almost everything you see is from Victorian Plumbing. I’m sure you’ve all heard of this site before. They seem to be doing a lot of advertising. Although the name says Victorian, they also sell a lot of modern bathroom suits and fixtures. We particularly liked their site because they stock so many different options, for all budgets. This was key when comparing styles and prices. We did however, find the sink and vanity unit, toilet and toilet seat on Ergonomic Designs. I didn’t like their site as much, as I found more complicated to navigate. However, the toilet and cover were cheaper on their site, and they were the only ones I could find the vanity unit with. So it definitely pays to shop around. As I mentioned, the bathroom had a heated towel rail that didn’t work. We were in two minds whether to replace it or remove it entirely. Stew has always dreamt of having underfloor heating. I was reluctant at first, as it seemed a flashy, and would probably cause our bills to sky rocket! However, he twisted my arm, and honestly, it’s the best decision we made. Because we have underfloor heating, there was no need to have a heated towel rail. The two together would make the bathroom a sauna! It’s really surprised me how much the flooring can heat the bathroom. I guess because it’s a small space, but it really heats up and it feels SO good to step out of the bath onto a heated floor. Removing the heated towel rail caused a few problems though. What we didn’t realise was that by blocking the pipes up, it would cause none of our radiators to work. It took some trial and error, and a few phone calls to our parents to realise the problem. There has to be an ‘always on’ radiator in our house. I don’t know if this is the same in all homes, but basically we had removed the always on radiator which then caused none of them to work. You can tell which is the always on, because it won’t have a thermostatic valve. This then meant we had to convert one of the other radiators in our home to the ‘always on’. We chose the hallway, and once we had changed it, our radiators all came back to life! Phew. The next issue was that it is near impossible to find a towel rail that isn’t heated. We always had a towel rail in our bathroom growing up that wasn’t heated, but nowadays it seems that it’s not a thing?! It took me forever to find one that I liked. I ended up finding it on Amazon in the end. And to find a towel rail that matches the toilet roll holder, also seems to not be a thing anymore?! Very odd! Although we settled on Metro wall tiles very quickly, we didn’t know what colour grout to add. 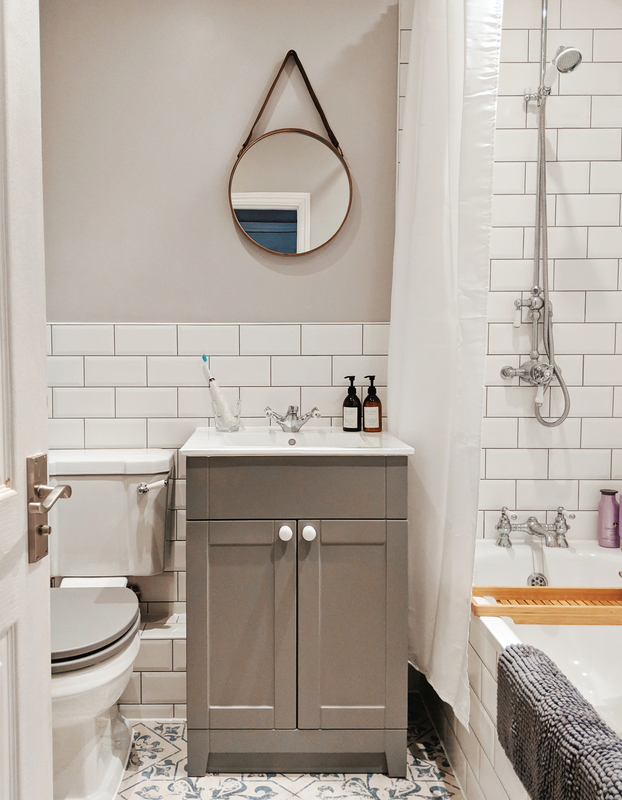 I presumed white, but as I looked through countless Pinterest images, I saw more and more with grey grout. As our bathroom was going to be grey, I thought this would be great. I’m so pleased with how it turned out and would highly recommend it! It’s a lot easier to clean and hopefully won’t show up signs of age as easily. We stuck with an off white for the floor tiles though, as the pattern is a type of blue/grey colour. Personally, I can’t stand the plastic bath panels you often find in bathrooms. We knew we didn’t want this, but didn’t know what to do in place of it. 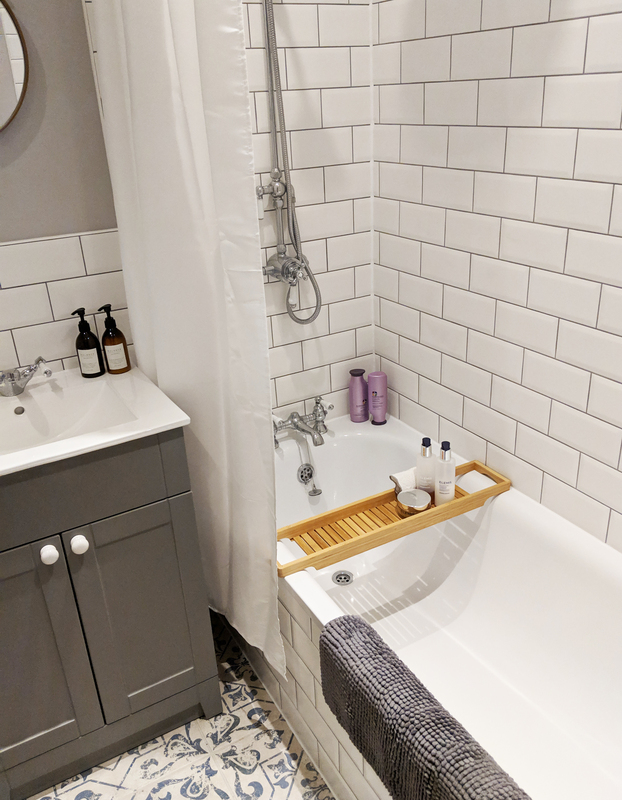 We debated a wooden bath panel, but weren’t able to find one in a grey colour that would match the vanity unit and toilet. So instead, we chose to have it tiled. Our friend managed to do this fairly easily for us by tiling onto a sheet of plasterboard, and drilling it to a timber frame he created. He did this in two section, with a smaller section towards the bath taps/waste, so that if we have any leaks, it’s easy(ish) to pull just that section off to fix the leak. It will mean a couple of tiles will get damaged, but we have lots left over, and fingers crossed for no more leaks anyway! 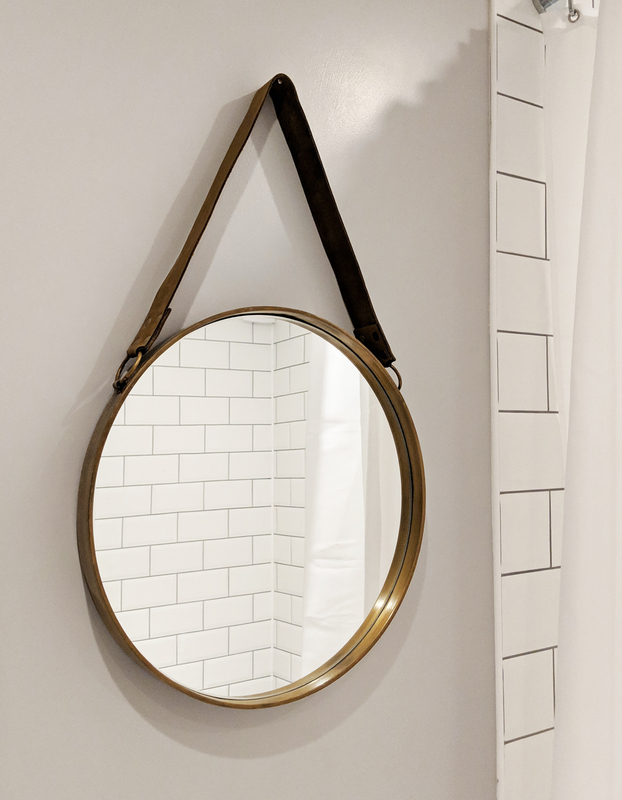 If you like the look of anything in our bathroom, I’ve tried to include as many links as possible below. I would love some greenery in our bathroom, perhaps with some hanging baskets over the toilet, as that corner is fairly plain. But because we don’t have a window, they would need to be fake plants. Something I’m not particularly keen on, but if we can find some good quality ones, I might be swayed. I’d love any recommendations on where to find fake plants?